Lavish, lyrical, haunting, and epic in scope, Once Upon a Time in America is Sergio Leone’s most spectacular spaghetti western—except that it’s set on the mean streets of Brooklyn during Prohibition. This weekend Cinefamily will celebrate Independence Day by screening Once Upon a Time in America not once, but three times. Starring Robert De Niro, James Woods, and Elizabeth McGovern, the film follows a group of childhood friends who rise to power as bootleggers. The original 229-minute cut of Once Upon a Time in America reportedly received a 15-minute standing ovation when it premiered at the Cannes Film Festival in 1984, but it was butchered for theatrical release by Warner Bros., which was concerned about its length. Recut without Leone’s consent to an insensible 139 minutes, the movie recently underwent a painstaking 4K digital restoration with the revamped 259-minute version debuting in 2012 at Cannes. It’s a much deserved restoration for the final chapter in the quintology that Leone began in 1964 with A Fistful of Dollars and expanded on with For A Few Dollars More. After completing the third film, The Good, the Bad, and the Ugly, Leone had tired of the Western genre that had brought him so much success. He was eager to film Once Upon a Time in America (based on the book The Hoods by reformed gangster Harry Grey) but American studios wanted him to make one more western. The result was the 1968 masterpiece Once Upon a Time in the West, Leone’s most expansive and ambitious film to date. 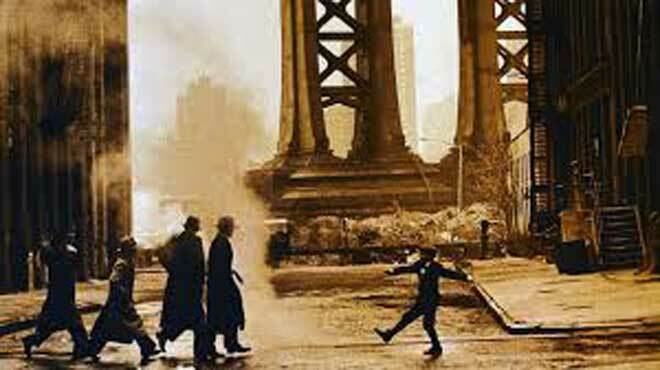 Filming for Once Upon a Time in America did not begin until 1982, fourteen years and one picture (Duck, You Sucker!) later. The film’s dreamlike, non-linear storyline shifts between 1933 where David “Noodles” Aaronson (Robert De Niro) narrowly escapes an opium den where two gangsters are looking for him and 1968 when an older, white-haired Noodles returns to Brooklyn after 35 years of hiding. The scenes of Brooklyn in the 1920s, shot by cinematographer Tonino Delli Colli, feature some of the most impressive visuals in film history, capturing the Jewish community and living conditions of the era. Equally acclaimed is Ennio Morricone’s haunting film score that underscores the somber images, extreme close-ups, and breathtaking establishing shots. Considered one of Morricone’s finest works, Once Upon a Time in America unfortunately did not receive an Oscar; it wasn’t even nominated because of a technicality. For all its complicated, interwoven plots and themes—not to mention its numerous interpretations (was it all just an opium dream? )—the movie is a tale of friendship, power, greed, and corruption. Whether it’s a gangster flick or a period drama, genre could no more contain Leone’s unruly and magnificent Once Upon a Time in America than myopic studios could contain its length.